पंजीकृत है, लेकिन अभी तक परिचालन नहीं. ↑ "Discontent over Sudan census". News24.com. AFP. 21 मई 2009. अभिगमन तिथि 14 जुलाई 2011. ↑ "Report for Selected Countries and Subjects". World Economic Outlook Database, April 2013. International Monetary Fund. April 2013. अभिगमन तिथि 18 अप्रैल 2013. ↑ International Telecommunication Union (14 जुलाई 2011). New country, new number: Country code 211 officially assigned to South Sudan. प्रेस रिलीज़. http://www.itu.int/net/pressoffice/press_releases/2011/25.aspx. अभिगमन तिथि: 20 जुलाई 2011. ↑ ".ss Domain Delegation Data". Internet Assigned Numbers Authority. ICANN. अभिगमन तिथि 1 सितंबर 2011. ↑ "A Country Study: Sudan". The Library of Congress. अभिगमन तिथि 24 अप्रैल 2014. ↑ "नया देश बना दक्षिण सूडान". अशोक कुमार. डचे वेले हिन्दी. 9 जुलाई 2011. अभिगमन तिथि 24 अप्रैल 2014. ↑ राजीव रंजन तिवारी (23 दिसम्बर 2013). "दक्षिण सूडान में आखिर क्यों मारे गए हमारे सैनिक". नवभारत टाइम्स. अभिगमन तिथि 24 अप्रैल 2014. ↑ "भारत ने दक्षिण सूडान में बंद किए तेल संयंत्र, सभी अधिकारी निकाले". जागरण. 15 अप्रैल 2013. अभिगमन तिथि 24 अप्रैल 2014. ↑ Fick, Maggie (8 जून 2009). "S. Sudan Census Bureau Releases Official Results Amidst Ongoing Census Controversy". !enough The project to end genocide and crimes against humanity. ↑ "South Sudan parliament throws out census results". SudanTribune. 8 जुलाई 2009. ↑ "South Sudan says Northern Sudan's census dishonest". Radio Nederland Wereldomroep. 6 नवम्बर 2009. ↑ "Average weather in Juba, Sudan". weather-and-climate.com. ↑ "South Sudan's Muslims welcome secession". The Daily Star. 9 जनवरी 2011. ↑ "South Sudan profile". बीबीसी न्यूज़. 8 जुलाई 2011. अभिगमन तिथि 25 अप्रैल 2014. ↑ "SustainabiliTank: The animist culture of South Sudan (Juba) clashed with Islamic North and the Divide & Rule Brits. Now they prepare for a January 2011 vote for Independence and the first break-away African State will be born. Many more should be allowed to follow. But this particular case is specifically hard as most people are still centuries behind". Sustainabilitank.info. अभिगमन तिथि 25 अप्रैल 2014. ↑ "Kiir announces new South Sudan ministries". Sudan Tribune. 21 अगस्त 2011. अभिगमन तिथि 24 अप्रैल 2014. ↑ "South Sudan gets new airline". Defenceweb.co.za. 6 सितम्बर 2011. अभिगमन तिथि 2 मई 2013. ↑ "संकट में दक्षिण सूडान". द पेनिनसुला, कतर. लाइव हिंदुस्तान. 22 दिसम्बर 2013. अभिगमन तिथि 24 अप्रैल 2014. ↑ अ आ "Southern Sudan has unique combination of worst diseases in the world – Sudan Tribune: Plural news and views on Sudan". सूडान ट्रिब्यून. अभिगमन तिथि 2014-04-24. ↑ अ आ "दक्षिण सूडान परिवार सर्वेक्षण" (PDF). दक्षिण सूडान मेडिकल जर्नल. दिसंबर 2007. ↑ हकीम, जेम्स (अगस्त 2009). "HIV/AIDS: an update on Epidemiology, Prevention and Treatment". दक्षिण सूडान मेडिकल जर्नल. ↑ एंबलर, शॉन (10 जनवरी 2011). "Support freedom for Southern Sudan and fight for workers' unity against imperialism". League for the Fifth International. अभिगमन तिथि 2014-04-24. ↑ "SUDAN: Peace bolsters food security in the south". IRIN. 18 अप्रैल 2007. अभिगमन तिथि 26 अप्रैल 2014. ↑ "South Sudan's N. Bahr el Ghazal denies reports that hunger caused death". सूडान ट्रिब्यून. 17 अगस्त 2011. अभिगमन तिथि 26 अप्रैल 2014. 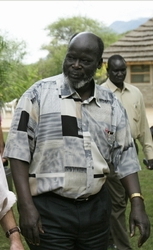 ↑ "BREAKING NEWS: Lou-Nuer armed youth enter Pibor town". सूडान ट्रिब्यून. 31 दिसम्बर 2011. अभिगमन तिथि 26 अप्रैल 2014. ↑ "Thousands flee South Sudan tribal conflict". अल जज़ीरा. 2 जनवरी 2012. अभिगमन तिथि 26 अप्रैल 2014. ↑ मेलड्रम, एंड्रू (6 जनवरी 2012). "South Sudan News: Ethnic clashes must be solved in the long term". ग्लोबलपोस्ट. मूल से 2012-02-05 को पुरालेखित. अभिगमन तिथि 26 अप्रैल 2014. ↑ "Obakki Foundation". Obakki.com. अभिगमन तिथि 27 अप्रैल 2014. ↑ "Rotary Club of Bridgton Lake-Region". Lakeregionrotary.com. अभिगमन तिथि 27 अप्रैल 2014.